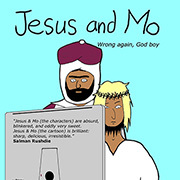 🙂 I HAVE BOUGHT jesus and mo. Vol 4. I think i will read it wery soon. I would have ordered it, but Christian Voice are picketing my broadband connection.. But books are just so last millennium. What if I order one of your T shirts instead? I’ve been meaning to do that for ages. There’s lots in the book which has never been up on the website. I chortled my way through it. This just screams for the blinking eyes effect on frames one and four that mention them crying. Crap, now I’m getting a bit misty myself. Vol 4 ordered (I already have Vols 1-3). I wish this site had a PayPal Donate button. Are Volumes I – III still available? If so, would you all recommend that a newcomer start with those? Two comments about the buying process: one – it’s really tricky to put BFPO addresses in (but I eventually found a way around it); two – I couldn’t reply to the thank you email, as the reply address didn’t show up in it. Hence me posting here and boring the arse off everyone else. I liked the emotional, slow zoom in. Could I be excused on purchasing power parity grounds? That’s almost what I earn in day. even I understood this comic …. Hades: Then by simple math you could most likely buy one every two days, what the hell (sorry) prevents you from getting at least one? So what are they going to get the barmaid for Christmas? Just added it to my Christmas list. Give the books names instead of numbers, just like Calvin and Hobbes and The Far Side etc. If the volumes are numbered then people who do not own volumes 1-3 are less likely to buy volume 4. And people who have no intention of buying 4 books (e.g. as gifts) are put off starting with volume 1. With named volumes, people will just buy the latest material, or whatever is on sale or has the funniest title. With named volumes, you can also recycle strips into collections of different sizes (again, like Calvin and Hobbes etc.). Due to the Cectic drought, I followed the link from that page. So I spent most of the day (Sunday) reading ALL of the J&M comics, pausing only to pee and get another beer. Author is a very wise person. And funny. And an accurate artist. When Mo is reflected in the mirror his nose tilts in the other direction. I probably won’t buy the books because I’m old and afraid to buy things on line. I confess (in a non-religeous way) I’m addicted. I came very close to e:mailing author to DEMAND book 4 be published. I’ll be OK for a while but I’ll soon need book 5. Books may be old fashoned but J&M books especially are handy to leave lying around when you have pious visitors. 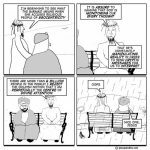 Sharp humour can be so infuriating to the righteous. Keep up the good work author. Seems that the economic crisis has hit our dear prophet and our dear saviour. Anyhow, I think that it would’ve been a good idea to make a PDF version of the book (just like book III) for the *sighs again* economically restricted! Maybe something from the shop will do! I agree with another poster: get a donate button. I don’t need any more stuff. Can these books be purchased from Europe? I can understand the problems with advertisements. People don’t want extremist nutters targeting their businesses just because they’ve advertised on a site that religious people disagree with. Do the books have the same cartoons in as the website? I would buy them but I’d be annoyed if I’d already seen all the cartoons! Thanks to everyone for your support. To answer Andrea, and qualify Billy Bob, only “Things not Seen” contains strips which haven’t been seen before. It has to be said, however, that all the J&M strips are much funnier when viewed in paperback form. ‘Cos nothing says funny like a dead tree? Only joking of course, I am a self-confessed bibliophile with a personal collection of around 3000 books. That’s barely half of a tree.